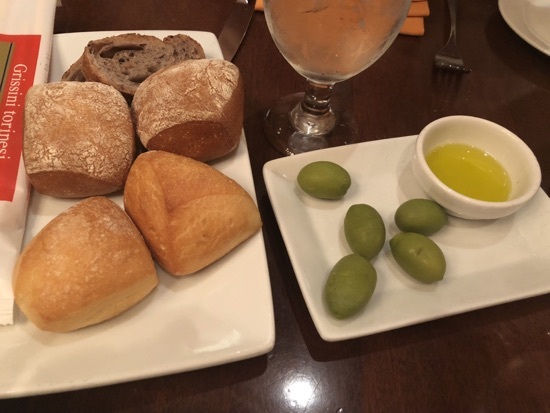 It's Sunday today - we're on the dining plan - that's means it's California grill brunch today! I'm really excited about this, we did it 3 years ago and it was fantastic. I tried to get back to sleep but gave up at 5.15am and went for a walk around crescent lake, it was so peaceful, only came across a handful of people the whole way round. 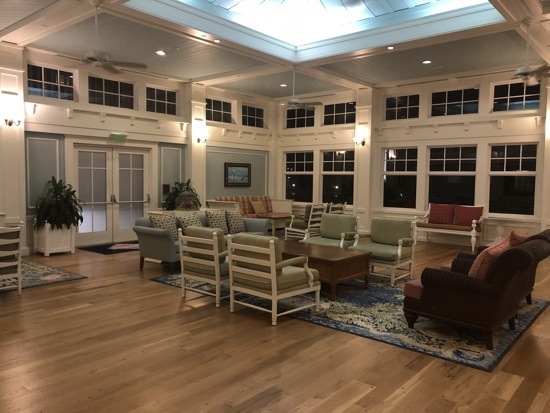 I sat on one of the swings on the beach area for a little while and when beach club market pace opened I went and grabbed myself a coffee in my refillable mug and took it to the solarium to drink, not a single person came in the entire time. 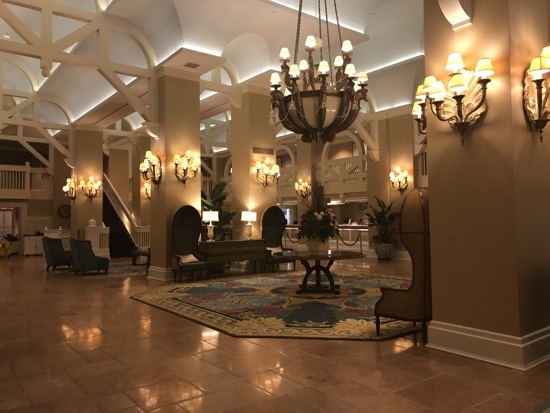 This is the perfect resort for some downtime from the craziness of the parks! I can't quite believe we went to two parks yesterday and didn't do a single ride or attraction! DH messaged me to say him and DD were awake and were going to head down for some drinks so I went to meet them, refilled my coffee mug and we all headed back up to our room to eat our breakfast snacks. I warmed DH and I's croissants up in the microwave and we sat out on the balcony watching the sun rise above spaceship earth whilst eating them. 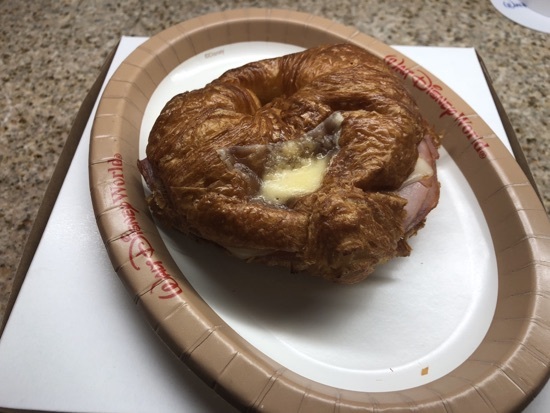 They were really good, even reheated the next day, lots of ham in them! Dd had her vanilla Mickey cupcake, the ears were chocolate buttons. We got ourselves ready and walked down to the bus stop to catch the bus to magic kingdom at 9am, the bus came about 4 minutes after we arrived and took about 15 minutes. Bag check was quite busy and we had no problems with our magic bands today. 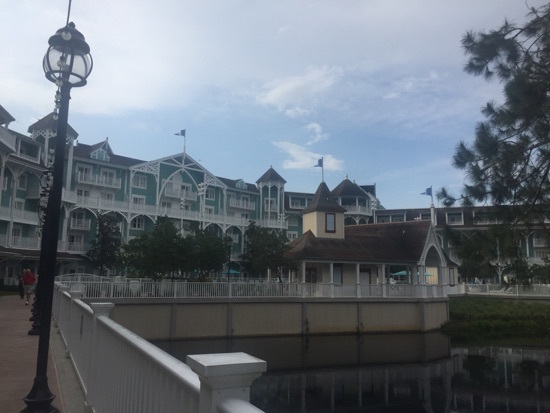 We made our way down Main Street to the carousel where we were on without any wait, the round to the barnstormer where I had made us a fast pass, it was a walk on so we went on standby then fast passes it. Next up was dumbo using a fast pass I had brought forwards and then I managed to do the same with a splash mountain fast pass. It was just gone 11 so we left he park and jumped on the resort monorail to the contemporary for our brunch reservation, we checked in about an hour early but they were able to seat us almost immediately. 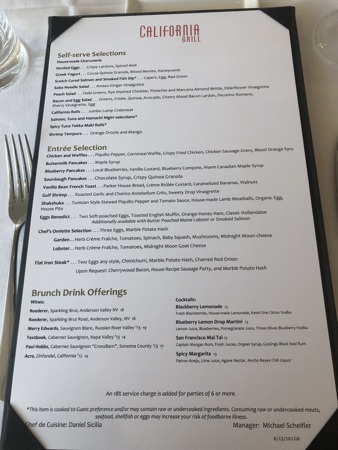 We were given a mimosa when we arrived and our amazing server Jess explained that we could help ourselves to the buffet selections, a Bloody Mary was included with the dining plan and we could order an entee when we were ready. There was loads to choose from. 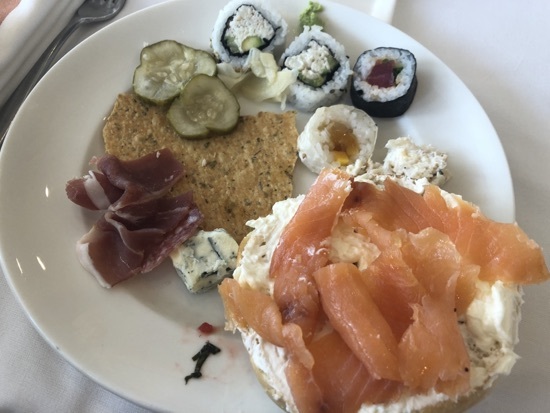 We got a couple of plates from the buffet with sushi, charcuterie, smoked salmon, bagel, cheese and crispbread. 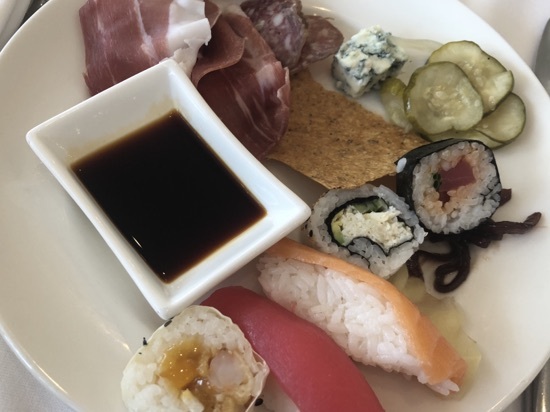 The blue cheese, pickles, sushi and fish dip were absolutely delicious, highlights of the buffet. 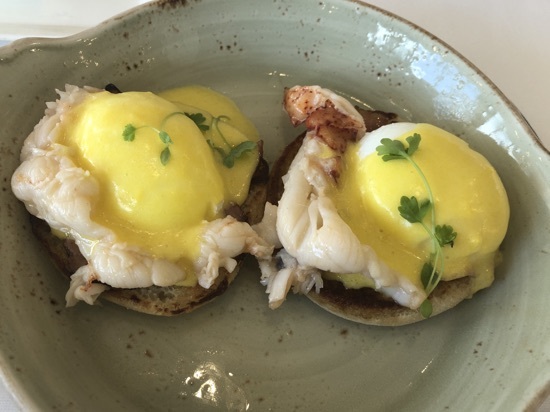 For mains DH and I both ordered the eggs Benedict with butter poached lobster. This was all cooked to perfection, the eggs were perfectly runny, the sauce was delicious and the lobster tasted fantastic! Jess kept our mimosas regularly topped up and when we were running low on boba balls due to eating them she replaced the glass with a fresh one. 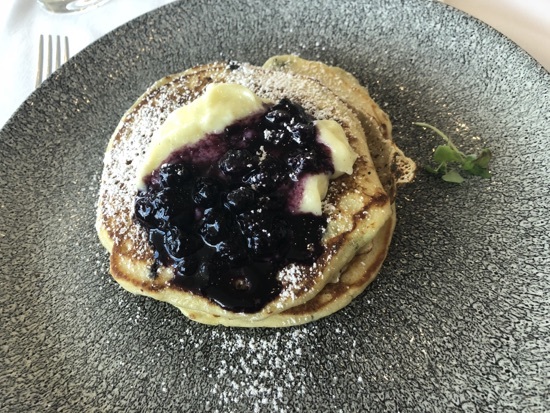 Dd had the blue berry pancakes, these had a hint of cinnamon to them and came with a jug of maple syrup, I finished them off and thought they were nice. 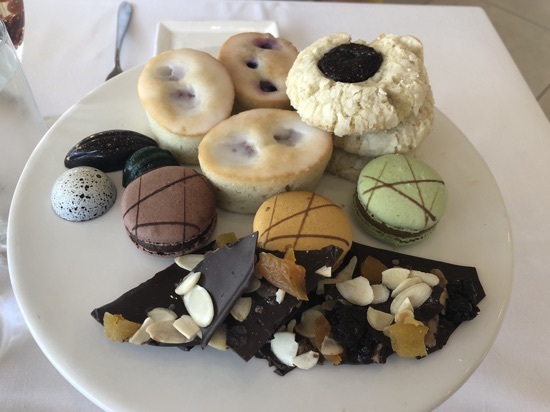 Then came the dessert plate, this had a dark chocolate with nuts, sea salt and dried fruit, salted caramel, chocolate and green tea macaroons, a coconut, mint and salted caramel chocolate, a fig rock bun type thing and a raspberry cake. They were all pretty good but the salted caramel macaroon and chocolate were absolutely amazing! This is expensive at $80 for adults and $48 for children. 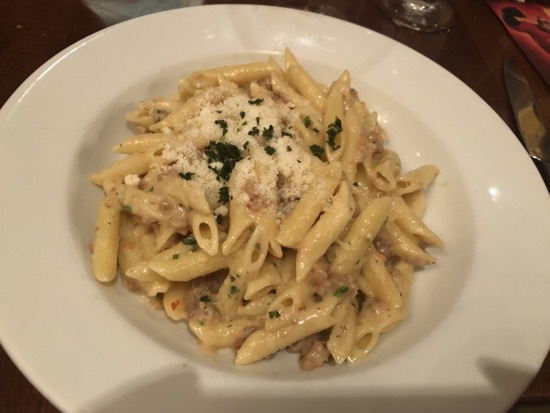 We used 6 dining credits for this and feel this was absolutely worth it, we spent an hour and a half there and our drink was constant topped up. 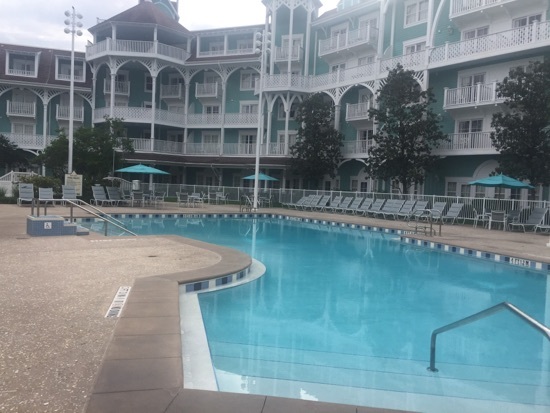 We waddled back to magic kingdom and a beach club bus was waiting, we got back to our room and had a chill out. The weather was hot hot hot again today, 35 degrees so we decided to go down to the pool for the rest of the afternoon, we got to stormalong bay just as they were emptying the pool so we walked back to the villas and went in the quiet pool near our room, it wasn't particular busy which was really nice. We got plenty of use out of our refillable mugs too. We set off at 6.00 and it looked like it was going to start raining at any moment, we quickly made our way round the world showcase to Italy and as we arrived it started to rain! Phew. We checked in and were seated a few minutes later, they were turning away walk ups saying they had no availability all evening. 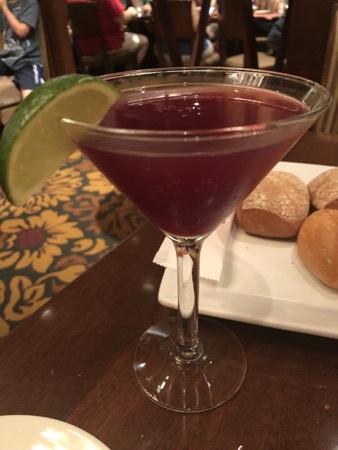 We ordered our drinks first, DH had a glass of red and I had a pomegranate cosmopolitan, this was citrus vodka, triple sec and pomegranate juice, it was really good! 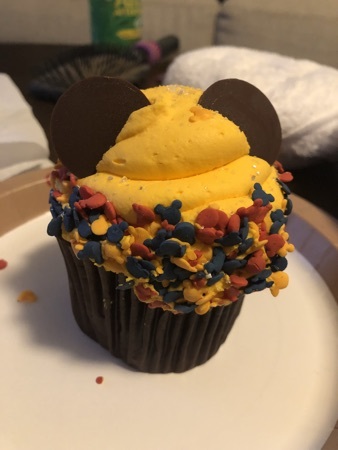 They used to do these at the California grill but they disappeared from the menu so I was pleased to see it! 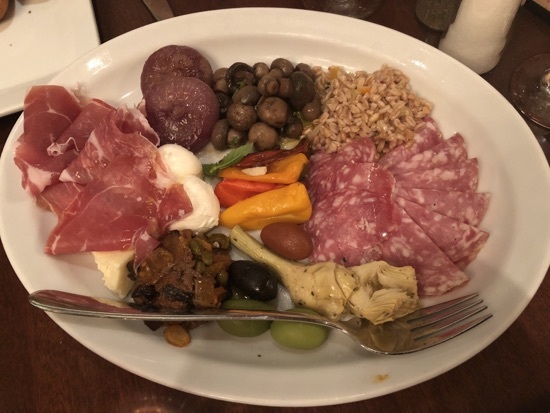 For started we got the antipasto misto this was $32 and was most definitely not worth that! The salami, ham and cheese were ok, the rest was pretty meh. It also had artichokes, onions, peppers, olives, aubergine salad, pickles mushrooms, olives and a lentil salad. 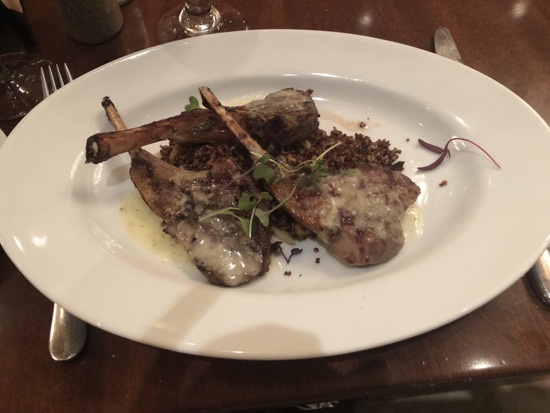 For mains DH had the lamb chops served medium rare with quinoa cost $31, he said they were ok but again not worth the price. So far not overly impressed with tutto! 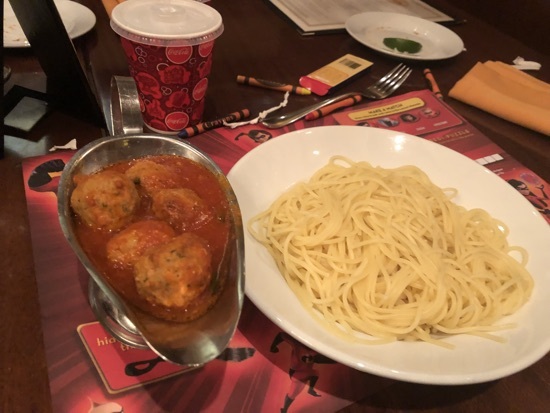 Dd had the kids spaghetti and meatballs, we asked for them to come separate in case dd didn't like the tomato sauce, she actually really liked the meatballs and ate them all but 1, this was $10. There was loads of spaghetti! Far too much for an adult let alone a child. For dessert DH had the tiramisu, he thought this was good and the best part of the meal, it was quite a sizeable portion too for $14. 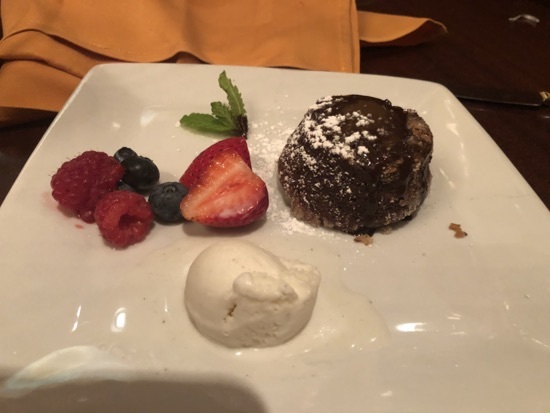 Dd and I shared the hazelnut chocolate cake with vanilla ice cream and chocolate sauce. This was a warm cake with a runny chocolate centre. 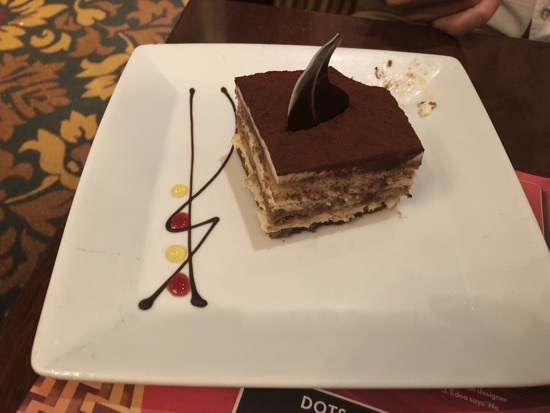 It was sooooo rich but really tasty. The ice cream was pitiful, barely a dessert spoon full! This was $14 and again expensive for what you got, it was tiny. 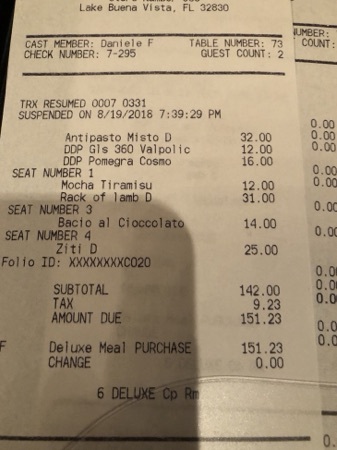 Our total came to $12 for DDs which we paid separate for as it wasn't a worthy use of a dining credit and DH and I's should have been $151.23! Absolutely no chance was it worth anywhere near that! We used 2 dining credits which made it abit more bearable. I find it hard picking new places to try over old favourites in case they end up being like tutto was. This is not somewhere we will be going back to. 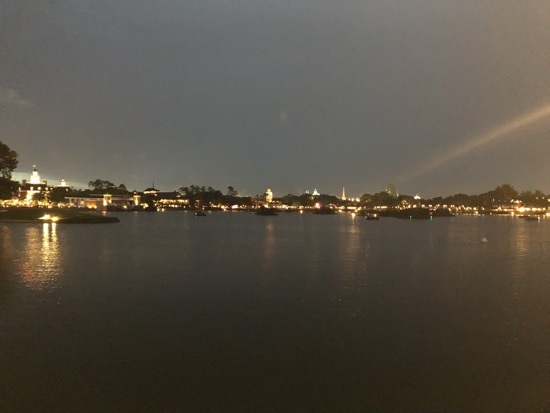 After we finished we headed out and it was still spitting slightly, I managed to pick up a fast pass for frozen ever after and I was debating waking back to the beach club leaving dd and DH to do some rides as I was so tired, I decided to stay out but didn't do frozen. While they were on the ride I got them a fast pass for mission space, DD loves this ride! By. 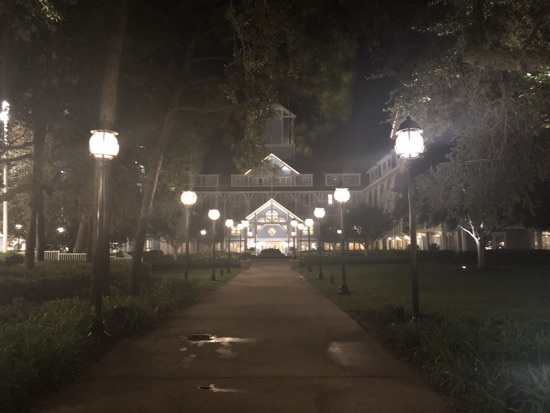 Is it was 8.55pm and the park was closing, the fireworks were delayed due to the weather and we walked back to our room and went to bed. Illuminations obviously ended up being shown later on as the noise of them woke me up, it was like they were going off on the balcony! 2019 HRH and POFQ Can't wait! ...I need to go back! 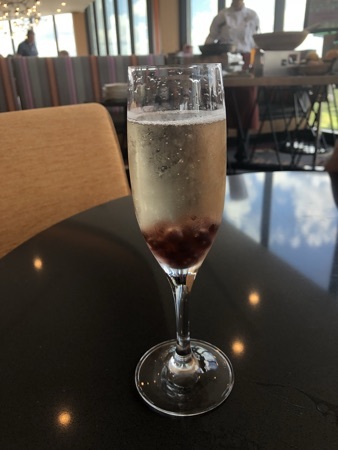 New Photo Added by missdopey - 20 Aug 18 10:59 AM. A good start to the day, but how disappointing your evening meal did live up to your expectations. The brunch looks amazing - shame about your disappointing evening meal although the pomegranate cosmopolitan sounds nice.